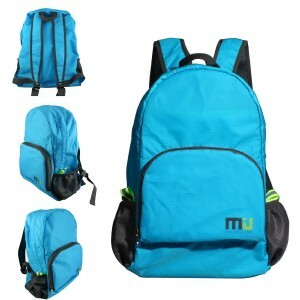 About a month ago the folks from MIU color sent me a backpack to try & review. Carry pouch: When I received the backpack it was folded in a built-in pouch. I figured it was going to be a hassle folding to put pack back in its pouch. It was easier than I thought. I usually have the hardest time fitting blankets or packs like this back into its original carrying pouch. A front pocket which is the pouch it folds back into. Reflective material on each side by mesh pouches. The straps are not padded. Straps typically won’t need padding when using with light loads/packs. The straps are made of the same nylon the rest of the pack is constructed of – it has mesh sewn on the back of the straps that rest on your shoulders with edging sewn on to make the trim. The buckles used are the standard plastic buckle with a 1” strap used to adjust size. I have a rather small frame – standing at 5’ 3” tall. I had to pull the straps almost to the smallest size in order for pack to fit me. This left approix another 5-6” of straps to fit anyone larger. Weight: This pack weighs approx 8oz. I had to use an old school postal scale to weigh. My digital scale that would have given me more accurate gram & oz weights decided not to work today. 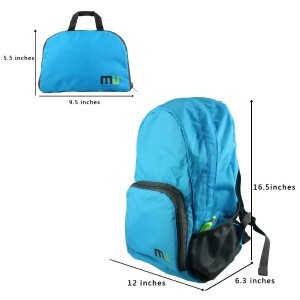 Usage: To me this can be a very functional & versatile pack for light weights. This can be kept in car to have handy for a spur of the moment day hike. For backpackers who set up camp & like to wander this can be a great additional pack to use to carry water, fire essentials & snacks Bring along on a vacation — I went on a cruise a couple of years ago & this pack would have been very useful for those day trips when exploring off the ship. Use for an overnight bag. Design: The design seems very sturdy – meant for a lightweight load. Solid colors appeal to me. 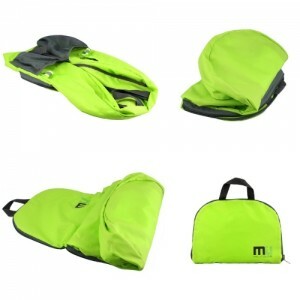 Nice carry pouch – Easily fold backpack into pouch to carry along. MIU COLOR® Packable Handy Lightweight Nylon Backpack Daypack – Foldable and Water Resistant. Made with durable and water resistant nylon material, a good companion for your trip. With widened breathable mesh shoulder straps, protect your shoulders and make your trip more comfortable. Have reflective patches on the both sides, which could reflect light, and makes it more safe when walking during night. Durable and beautiful hardware accessories, which are sturdy and have a good touch sensation. Dimension: 12*16.5*6.3 inches when open; 9*5.5 inches when folded. Very easy to fold, makes it light to carry.